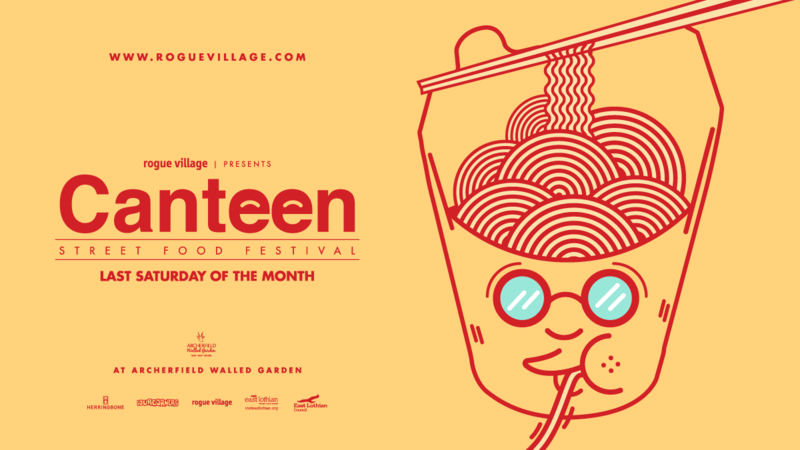 How about having an AMAZING day of street food, music & fun at Archerfield Walled Garden?! ScotRail has launched a new app for all employee phones and tablets to help prevent suicides on the railway. 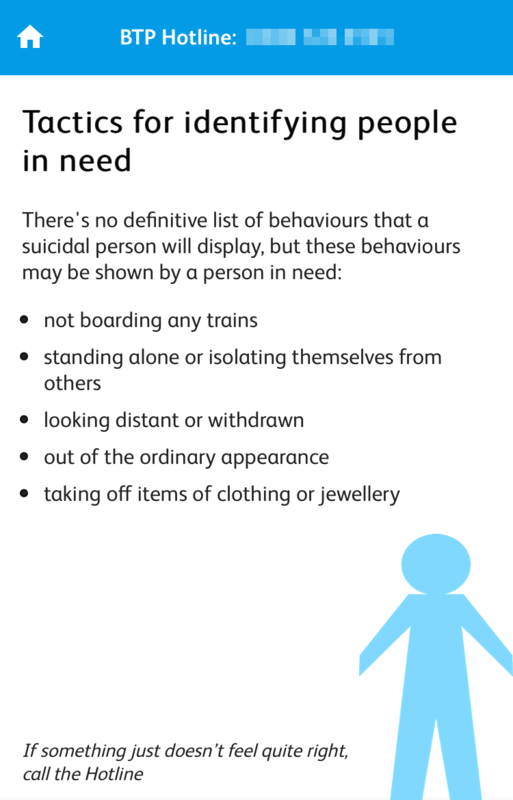 Developed by Network Rail in partnership with Samaritans and the wider rail industry, the app gives employees guidance on possible warning signs and how best to support someone in need. It also provides a direct link to the British Transport Police for immediate support and advice. The app is now available to all 4,500 ScotRail employees on their smartphones and tablets and is in addition to Samaritans’ specialist suicide prevention training that more than 300 ScotRail Alliance colleagues have completed. The app has been available on all Network Rail Scotland employee devices since 2017. The ScotRail Alliance is also supporting the ‘Small Talk Saves Lives’ campaign, which aims to give travellers the confidence to act if they notice someone who may be at risk of suicide on or around the rail network. 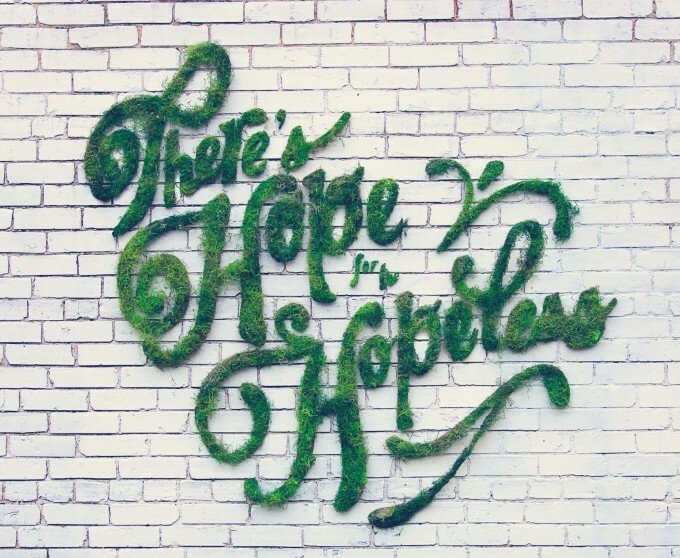 Suicidal thoughts can often be temporary. Strike up a conversation with a simple question such as asking about the weather, or where they’re travelling today. If you think someone may need help, introduce yourself, encourage them to talk and focus on listening. There’s no evidence that talking to someone who could be at risk can make things worse. It’s important to act. If you don’t feel comfortable approaching the person yourself, tell a member of staff, a police officer or dial 999. “The ScotRail Alliance takes its commitment to supporting those with mental health problems very seriously. “Encountering someone in distress on the railway can be a daunting experience, even for the most experienced of our people. That’s why we’ve launched this app for ScotRail employees, to offer quick help and advice to those who come across someone who needs urgent support. 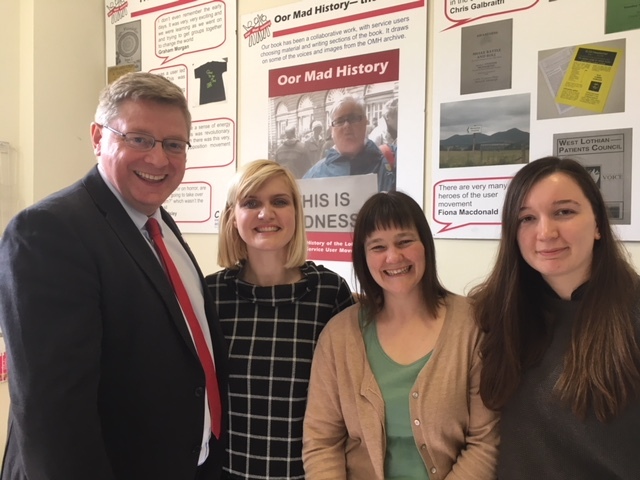 Martin Whitfield MP has visited Musselburgh-based CAPS Independent Advocacy, which provides individual and collective advocacy for local people who use or have used mental health services. During the visit, Mr Whitfield found out more about the organisation’s current activity and the support it provides for local people. He also discussed the way his office works together with members of the CAPS team. “This was my first visit to CAPS Independent Advocacy. It was useful to put faces to names and learn more about the vital work the team does with people who use or have used mental health service and need some extra help and support. “The assistance they provide enables their service users to set their own agenda and have a stronger say on decisions which affect them. This support is of particular importance currently with the introduction of Universal Credit affecting the lives of so many vulnerable people locally. Iain Gray MSP and Martin Whitfield MP are holding a public meeting to provide a further opportunity for rail users to highlight ongoing problems with the service on the North Berwick Line. The local parliamentarians have decided to hold the meeting following continued widespread frustration and complaints about the issues that have dogged the line, such as serious overcrowding, frequent delays and cancellations, and problems with ticketing, including broken ticket machines. The meeting will take place on Thursday 3rd May at Prestonpans Town Hall starting at 7pm. The ScotRail Alliance has been invited to send a representative to help answer questions from those who attend the meeting. “I have spent years campaigning for the kind of safe, regular and reliable rail services that people in East Lothian need. Sadly, despite various promises and warm words from successive SNP Government Rail Ministers and ScotRail bosses, little progress has been made. “Indeed, I continue to receive a regular flow of complaints from local rail users about their poor experience on the North Berwick Line. Frequent overcrowding, sometimes to the point where passengers have felt unsafe, delays and cancellations cause huge frustration to those using the line. “Last year I helped to organise Prestonpans’ community council’s public meeting on local rail services. That event was well attended and provided an opportunity for local rail users to make their feelings known and quiz ScotRail about the numerous problems they were experiencing. “Some commitments were made at that meeting around delivering improvements on the North Berwick Line. However, I think it’s clear to anyone who uses services on the line that very little has changed over the last 12 months. The ScotRail Alliance has launched a £400,000 Cycle Fund, as part of its ongoing commitment to improving access and facilities for cyclists at Scotland’s railway stations. Over the next four years, £100,000 a year will be made available to local councils and community organisations. This funding will be used to deliver projects which contribute to the ScotRail Alliance’s vision of providing a ‘doorstep to destination’ journey for customers, whilst reducing congestion and pollution. The fund will provide up to 50% of project costs. Improve directions and signs for cyclists to and from stations. Upgrade connections between stations and other local services such as schools and town centres. Introduce new facilities for customers accessing stations by bike. “We’ve delivered an unprecedented investment in cycling in recent years, with the provision of Bike & Go at 12 stations, and over 1,200 extra cycle spaces. “The Scottish Government is committed to getting more people to make active travel choices by encouraging modal shift wherever possible. 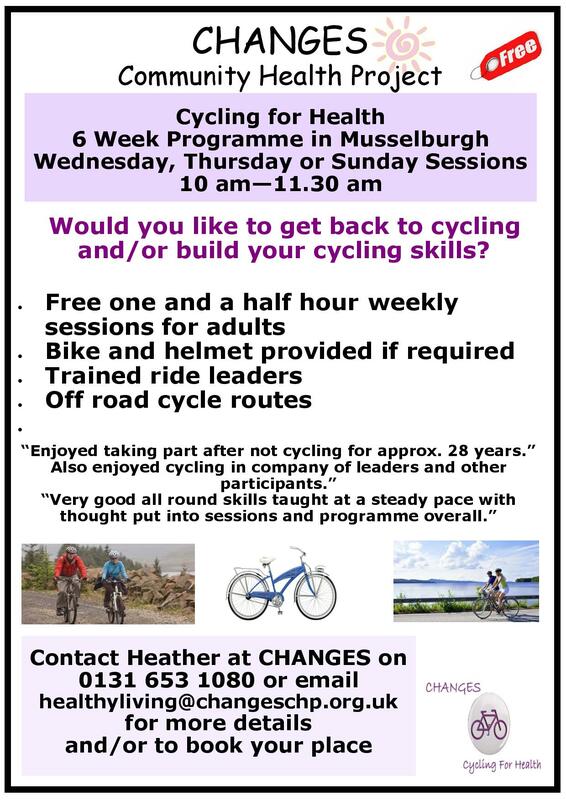 The Cycle Fund offers organisations the opportunity to work with ScotRail to deliver enhanced cycling infrastructure and encourage as many people as possible to integrate cycling into their everyday journeys. “This is all part of our core vision to make the railway as accessible as possible and jointly supports the Scottish Government’s vision to increase the number of people using rail, and the proportion of journeys made by bike”. People across East Lothian are being urged to highlight the work done by local estates and land-based businesses to help their surrounding communities flourish, as nominations for the Helping It Happen Awards 2018 get underway. To nominate, people are being asked to share how their local estate, farm or rural business has made a positive contribution to their area. Entries can be submitted via the Helping It Happen website – www.helpingithappen.co.uk – before the closing date of 13 July 2018. To celebrate the launch of the 2018 awards, David Johnstone, Chairman of Scottish Land & Estates, visited Luss Estates at Loch Lomond. Together with Drimnin Estate, Luss Estates were joint-winners of the Rural Business category at the 2017 Helping It Happen Awards. “We want to highlight and celebrate the significant positive contribution land-based businesses make in rural areas throughout Scotland – in particular, the ways in which they add value to the local economy and the environment for the wider benefit of the community. We were incredibly pleased with the success of the augural awards in 2017 and are building on this in 2018 through the creation of additional categories to celebrate innovation in farming and environmental enhancement. Entries for the Helping it Happen Awards 2018 will be reviewed by an independent judging panel with three finalists selected in each category. The winners will be announced at the Awards ceremony which will take place at The Balmoral Hotel, Edinburgh on 3 October 2018. Action for Happiness – @actionhappiness helps people take practical action for a happier and more caring world. And guess what? Being kind makes you happy. Next time you’re going for a bus, why not leave a pair of gloves, a joke or a book…or a chair? The Guerrilla Upholsterer a.k.a. @mick_sheridan leaves beautifully restored chairs in bus shelters. Change the World for a Fiver – Change the World for a Fiver is a book, priced at a £5, which is packed full of ideas on how to change the world for a better place. Buy two and give one to someone. Better still buy your copies from Hive, the network of independent bookshops. Deeds – You’ve heard the expression, Actions speak louder than words. It’s true. Social Media makes it easy for us to say kind stuff, retweet kind stuff and like kind stuff but don’t forget to DO the kind stuff. (Having a Digital Detox every so often is really good for you and frees up some time too). Flashmobs – A flashmob is a group of people who assemble suddenly in a public place, perform an unusual and seemingly pointless act for a brief time, then quickly disperse, often for the purposes of entertainment, satire, and artistic expression. Who can remember the Puffin Flashmob outside the National Gallery? Take a look at this Mannequin Mob…would something similar work in East Lothian? Guerrilla Gardening – @guerillagarden Guerilla Gardening is the act of cultivating a neglected area. This could include setting up a community garden growing vegetables or planting up a neglected roadside verge with brightly coloured flowers. A side shoot is Incredible Edibles which includes projects in Dunbar. Hugs – Free hugs is a social movement involving individuals who offer hugs to strangers in public places. You might not be entirely comfortable making physical contact with a stranger, but would this ball pit experiment work here? Improv Everywhere –@ImprovEvery is a New York City-based prank collective that causes scenes of chaos and joy in public places. Check ’em out they’re freaking hilarious. Jokes – Jokes, pranks, silliness, high jinx and tomfoolery – when good-humoured, and made with the intention to make the ‘victim’ laugh as much as the prankster – can really lift a person’s spirits. 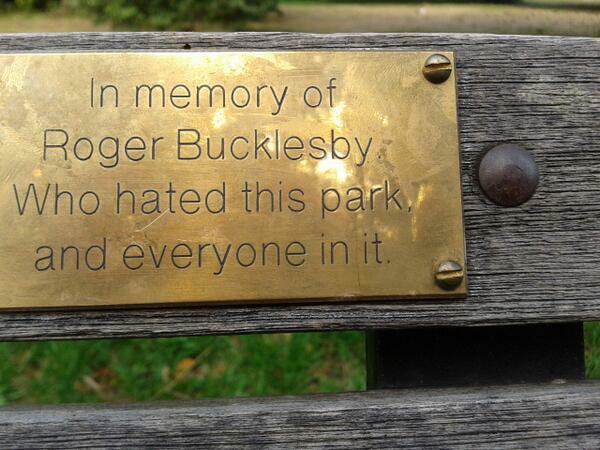 Take a look at these daft ‘memorial’ bench plaques. Cuthill Park in Prestonpans played a trick on locals when it announced the installation of a plaque to commemorate ‘physicist’ Avril Fish. Yes, it was an April Fool’s joke. Kids – Free cakes for kids is a community service to families who find it difficult to provide a birthday cake for their child. Little Free Library –Little Free Libraries build and install Little Free Libraries across the UK with the aim of increasing access to books for children, young people and their families. Find them on Twitter @LtlFreeLibrary. If you like this idea you will love the Athelstaneford Book Nook. On a similar vein is Bookcrossing. the practice of leaving a book in a public place to be picked up and read by others, who then do likewise. Why not leave a note inside a library book for a stranger to find. Microfinance –@Kiva is a non-profit organization with a mission to connect people through lending to alleviate poverty. Leveraging the internet and a worldwide network of microfinance institutions, Kiva lets individuals lend as little as $25 to help create opportunity around the world. Learn more about how it works. Sign up here. One Action – @takeoneaction is Scotland’s global action cinema project linking audiences, movies, campaigners and communities. See the change you want to be in the world! Pay it Forward – if you’re lucky enough to be the recipient of kindness or good fortune, pay it forward. The vision for Pay it Forward UK is to assist people to have the opportunity to give to others – particularly those less fortunate than themselves. One good deed might not seem like much, but if everyone did something good for someone else, then the cycle of generosity and kindness can help us to become better people. @PayitForwardDay is on April 28th this year. East Lothian charity, Walk With Scott Foundation has raised over £215,000 and supported 31 charities over the past 5 years. QR codes – Environmentalists have used QR codes to great effect to sticker products and give consumers information that companies prefer to keep quiet. As well as being used by activists, an enterprising person has linked QR codes with kindness and sell kindness ‘tokens’ with a QR code on that ‘tracks’ the journey of the token. Subtervising & Stickering – @WeFixYourAdvert are ‘improving’ certain prominent adverts in their own sassy way. Although technically illegal, a similar guerrilla stickering campaign on the London Underground has brightened up many a commuter’s morning. Make Magazine produced a series of stickers which could be stuck on some products in toy stores to highlight how playtime is becoming an endangered activity. Urbanism -It’s easy to fall into the trap of thinking that big cities and towns and unfriendly, uncaring places and wee villages have a wonderful sense of community. 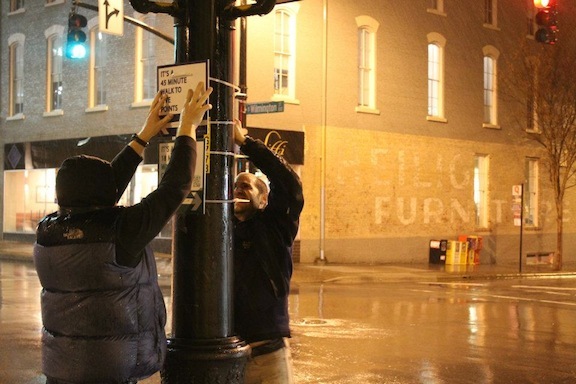 A group of North Carolina residents mounted walkable direction signs around their town. What changes would you make to your town to make East Lothian a wee bit more pleasant for residents and visitors? Public bike pumps? Vegetable vending machines? Check out some of the improvements that three designers made in Paris. If you want proof that cities can be caring places, read these examples. Better still, be the example. Voice-activated – You know how it is, you have a new label maker, you’re feeling a bit mischievous and next thing you know, there are confused shoppers trying to operate a ‘voice activated’ trolley. No? Just me then. Also works well on doors and hand dryers. Have fun. Weird and Wonderful – Using materials found in the local environment and some basic artist supplies such as clay and paint, Mark Buckman crafted unique quirky pieces and placed them back on the Littlehampton beach where he had found them for beach visitors to discover. Perhaps you’ll find something at Dunbar’s Stone Stacking Championships in April 2018…. X – X is for Crossing -Would Remi Gaillard’s famous prank work in East Lothian? And where should we carry it out? Yarnbombing and craftivism – Crafty members of @musselburgh2016 decorated the Honest Toun with all sorts of creations to foster interest in the Riding of the Marches – and kept on going. You can see their work on Twitter. Be kind to everyone you meet, not because of who they are but because of who you are! In celebration of Scotland’s Year of Young People, conservation and education charity, the Scottish Seabird Centre, seeks a young person to join the Board of Trustees for the duration of one year. The Seabird Centre recognises the importance of the themed year and the need to engage the next generation, who can bring invaluable insight, experience and ideas to further enhance the work of the charity. Applications are sought from those working in the conservation, environmental education or the wildlife tourism sector who are aged between 18 and 35 years. The appointed applicant will contribute to building on the Centre’s success and its exciting plans for the future, working with the diverse and experienced Board to create a world-class facility and activity programme dedicated to marine conservation and education. David Windmill, Chair of the Scottish Seabird Centre, said: “We are keen to diversify our focus beyond that of seabirds and the local environment, to explore the wider marine environment and wildlife: life above and below the waves. We want to highlight the many threats that our wildlife now face and what needs to be done to help. Tom Brock OBE, Chief Executive of the Scottish Seabird Centre, adds: “From appointment, the successful applicant will have a position on the Board for one year. This will involve attending meetings in North Berwick and actively contributing with ideas on engaging and attracting young people to the Centre now and in the future. The Scottish Seabird Centre’s Board of Trustees is responsible for the overall management and governance of the charity. It sets the strategic direction of the organisation and monitors performance. Trustees have a wide range of skills and experience required for the various areas in which the charity operates. They are recruited against a matrix of skills, knowledge and experience which is regularly reviewed. All trustees are interviewed and approved by the Board. The first meeting the successful candidate will attend is Wednesday 21 March 2018.